It's time for my first race report of the year! Usually, I have already run a number of races this late into the year. But, this year I have been struggling with a bad relapse of my autoimmune disease and with a new condition of chronic migraines (which is TERRIBLE!). To make a long story short, I really can't run right now due to severe pain and heart issues. I mean, I can still run. I just can't hold a run for longer than 5 minutes at a time and that run pace is more like a slow jog, around 12:30-13 minutes per mile. Still, I consider it running since the effort is about the same as my healthy 9 minutes per mile pace. My health is why my first race of the year occurred at the end of April instead of in January. 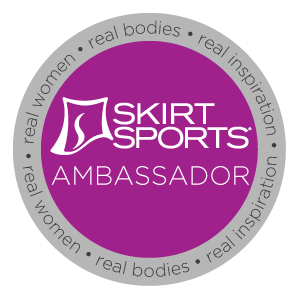 But hey, I'm still going and trying and persevering because I love running and I love running races! And this race was a beautiful start to my 2017 racing season: the Thanksgiving Point Tulip Festival 5K. 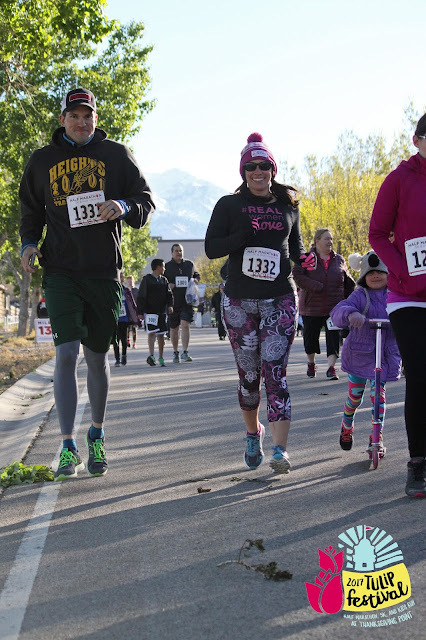 My husband and I signed up to run the 5K, and my daughter wanted to run as well, but she wanted to do the kids' mile. 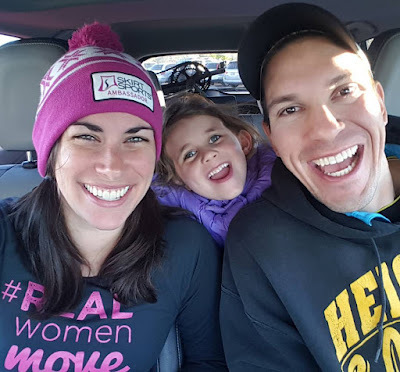 At first, I was trying to think of someone who could watch her during our race, which was difficult since it was so early in the morning and 45 minutes from our home. Then, she asked if she could just ride on her scooter during our race. After a few successful scooter-run trials where I ran while she scootered beside me, I figured why not. And that's what we did race day morning. Keeping warm in the car before the race starts. It was pretty chilly and kinda windy when the starting gun sounded, so we were somewhat bundled up. 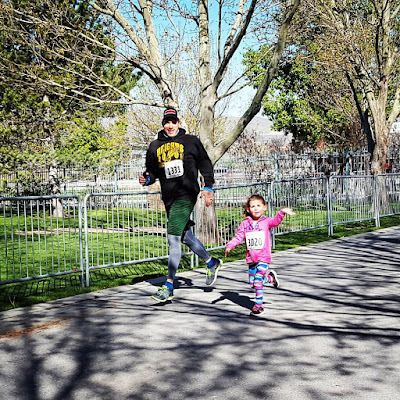 It was a slow run for us due to my health, but my amazing husband stayed beside me the entire race, as did my daughter. She was a great sport, making sure to stay to the side of the course so that she would be close to us and not run into other runners. We saw plenty of beautiful flowers, since it was the tulip festival, but the 5K does not go into Ashton Gardens (where the full festival is), like the half marathon does. We still got to run under vine covered awnings and see the landscaped flowers in bloom however. We stuck together the entire 5K, and June rocked it on her scooter. But every time there was a picture opportunity, we got photo-bombed by the people in front of us moving right in front of June! 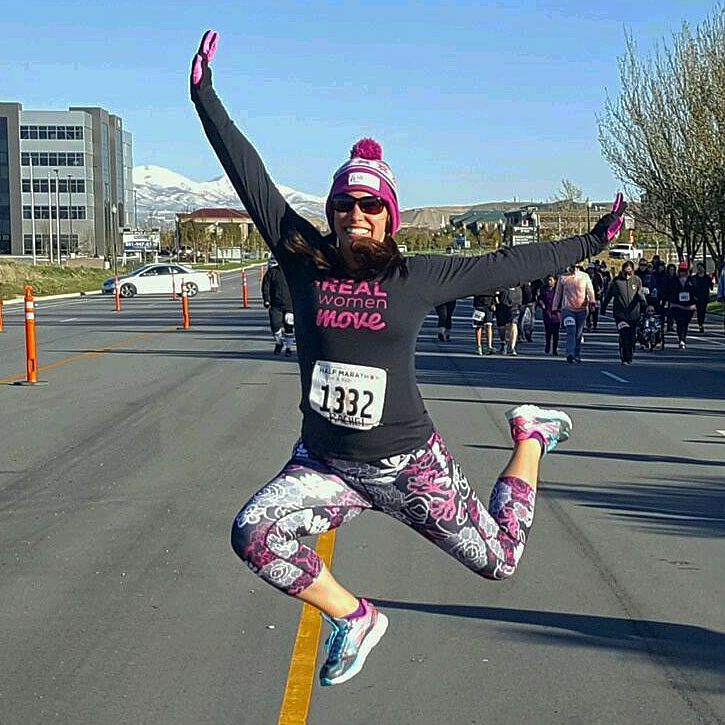 My race outfit is all Skirt Sports: redemption capri in enchanted, #REALwomenmove long sleeve, beanie, and even gloves. I was plenty warm, without getting too hot. And I felt pretty cute, even though I don't take the best race photos. 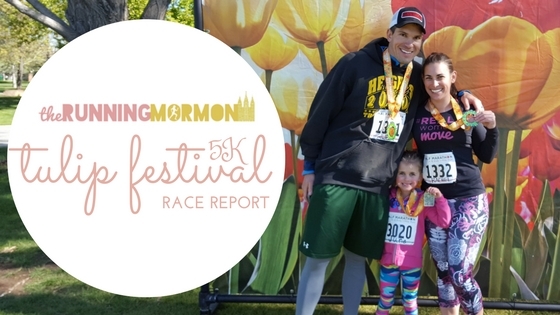 We had such a fun time running this race as a family. 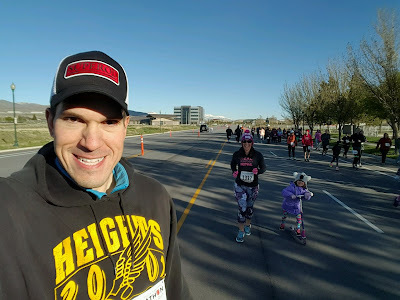 Though a slow 5K for me--one of my slowest--I pushed as hard as I could safely push, and I finished without having further illness complications. We finished in about 48 minutes, and I feel like I raced smartly in my condition. I'm so thankful that I still have health enough to even just complete a 5K race. I love the atmosphere of running events. I love pushing myself on the course. I love the spectators and volunteers and the race day festivities. 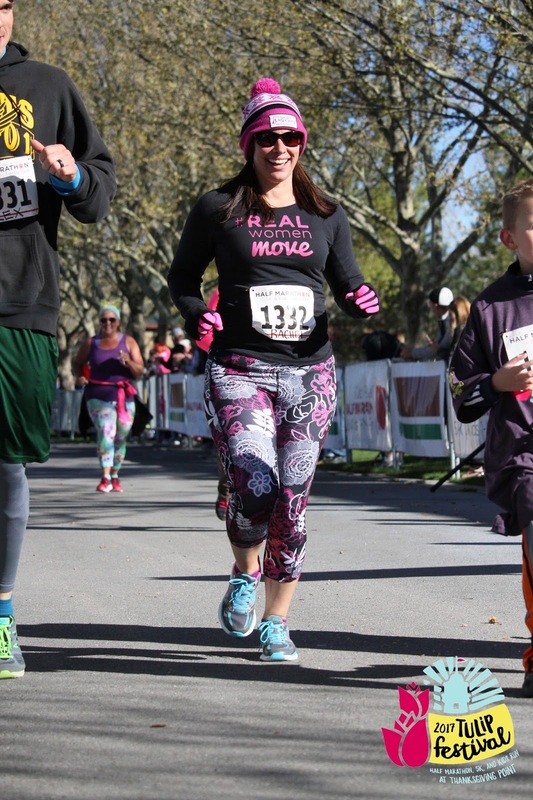 And I am so thankful I was healthy enough to do this race. June's race started about 30 minutes after we finished the 5K, so we loaded up her scooter in the car and packed away her winter coat. Scootering 3.1 miles was a great warm-up for her! My husband was able to run the Kids Mile with her, and she ran the whole time! They got to run by all the baby animals at the farm, which June loved. She calls baby animals "cuties" and told me that she wouldn't let the cuties distract her from running. She finished in 10:54, and 8th in her age group. We're so proud of her! 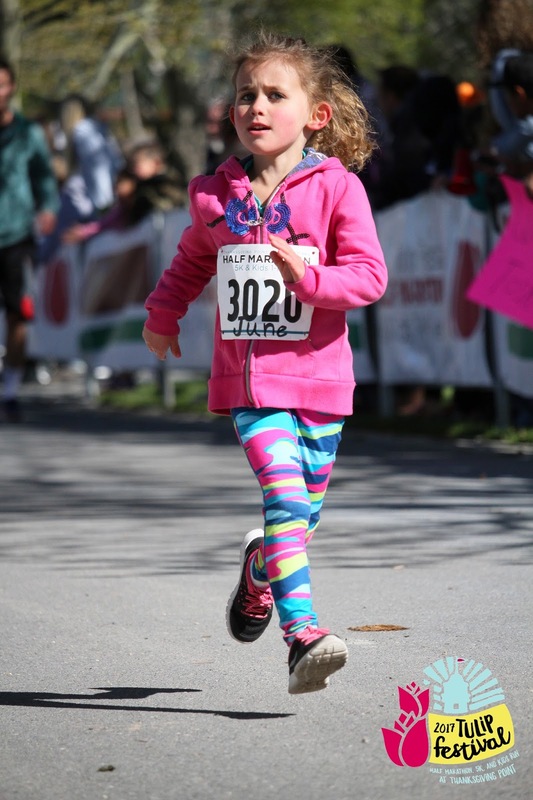 We told her to try her hardest and to make sure she finished, and she did just that. They're coming up on the finish line, still going strong! Killing it on her race! She ran the whole time and did a great job. She looks like she's flying here. Post-race we enjoyed the music, the chocolate milk, the bananas, and the medals. It was a great experience for our whole family. 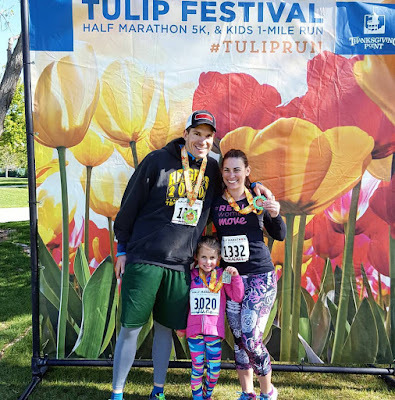 Part of our race swag included free entries to the Tulip Festival gardens, and we added an additional two miles walking out to Ashton Gardens and around the whole tulip festival. We wore our medals (and later our race shirts) proudly the rest of the day. 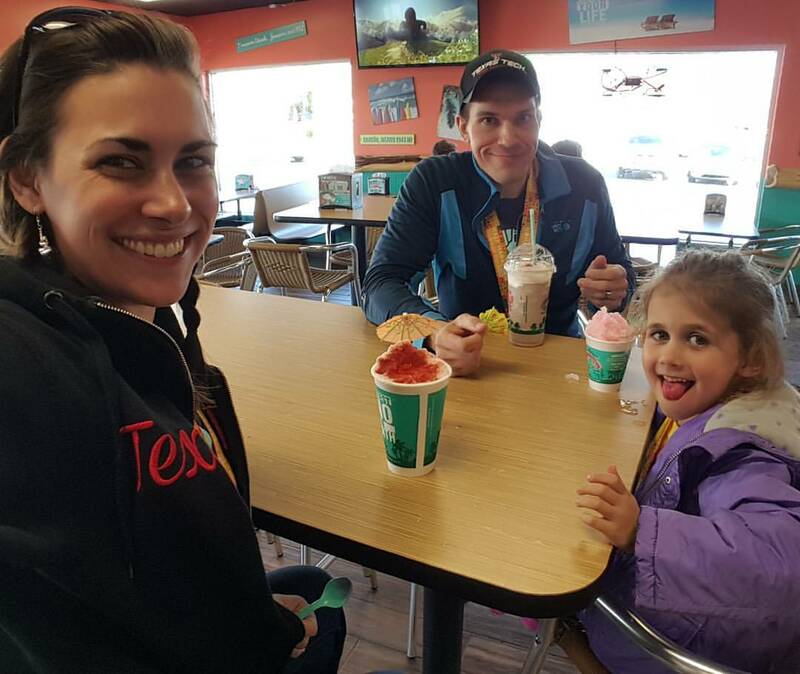 And we ended our post-race celebrations with a treat from Bahama Bucks.